Pedestrian bridge at 50 West Street. Rendering by DBOX. Now that exterior work has completed on 50 West Street – the 64-story, 191-unit mixed-use tower dubbed simply “50 West” under development in the Financial District – crews are now focused on building a 6,800-square-foot public plaza around the base of the building and a pedestrian bridge over West Street (a.k.a. the West Side Highway). Renderings of the spaces have been revealed by the Wall Street Journal. The 24-hour plaza will feature an art gallery, a café, vegetation, and seating. The pedestrian bridge, dubbed the West Thames Street Bridge, will feed directly into the plaza. It will boast steel structural supports and a glass roof and walls. The New York City Economic Development Corporation (NYCEDC) is building the new pedestrian bridge, which will replace the Rector Street bridge located a block northward. Demolition of the Rector Street bridge and construction of the new one is expected to last two years. 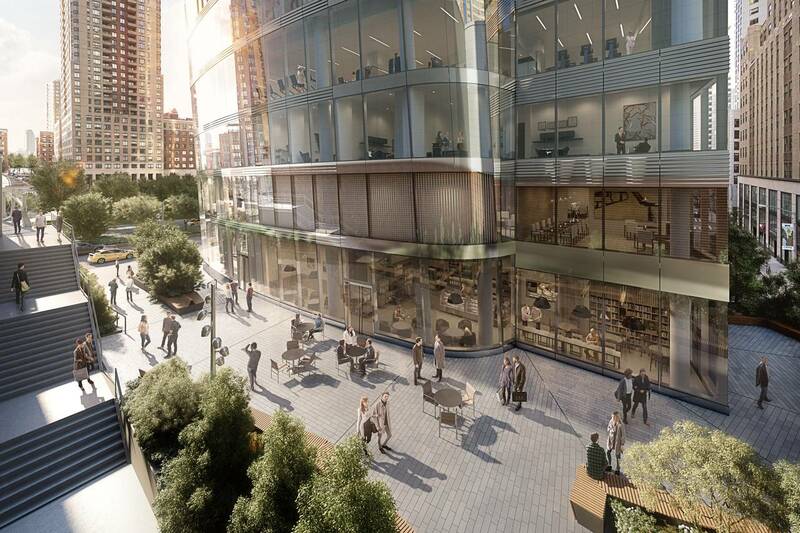 Rendering of public plaza at 50 West Street. Rendering by DBOX. 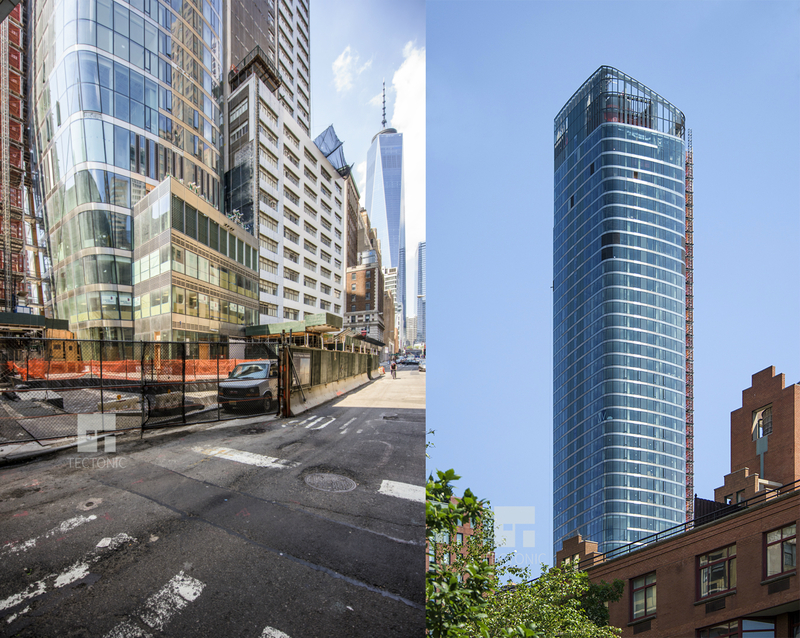 The 782-foot-tall, 584,277-square-foot 50 West Street hosts condominiums averaging 2,126 square feet apiece. Roughly 60 percent of the apartments, ranging from one-bedrooms to a five-bedroom penthouse, are in contract. The building also features 15 office condominium suites. Time Equities is the developer and Helmut Jahn is the design architect. SLCE Architects is serving as the architect of record and WXY Studio is behind the design of the new pedestrian bridge. Completion is expected later this year. 50 West Street. Photos by Tectonic. 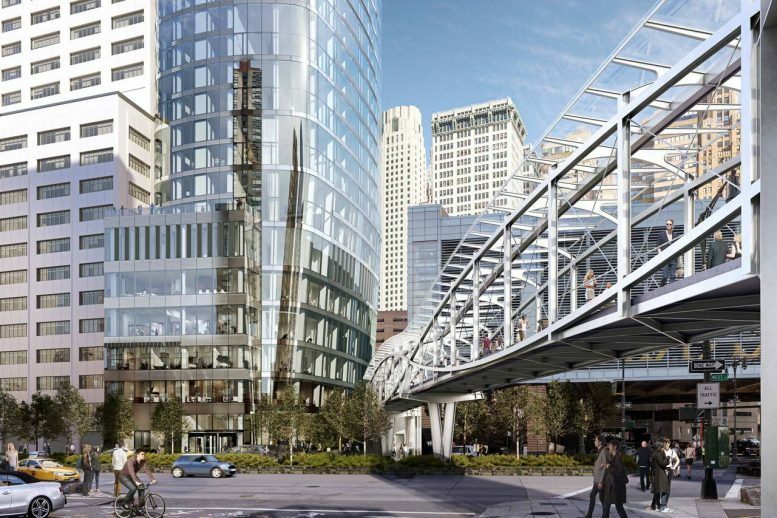 2 Comments on "Public Plaza, Pedestrian Bridge Outside 50 West Street Revealed, Financial District"
Free toll bridge in the Financial District, the up-sizing of towers are having all progress. Wonderfull shape and finishing, congrats for this new tower JAHN Architects!